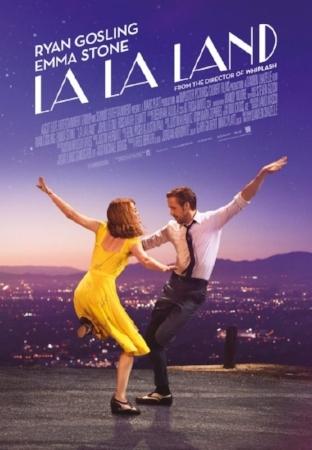 Film Review: “La La Land,” directed by Damien Chazelle, 2016; winner of seven Golden Globe awards. Los Angeles is a major character in “La La Land.” It’s appropriate that the movie starts with something quintessentially L.A.—a traffic jam on the freeway. In a lesser film, the bottleneck would result in road rage, either violent or a spoof. In this filmic ode, the drivers get out of their cars and break into a lively song-and-dance number. Talk about a strong beginning! Mia (Emma Stone), an aspiring actress, and Sebastian (Ryan Gosling), a jazz musician, are among those stuck in traffic. When at last the congestion eases up, we get to follow Mia. She works in a coffee shop, goes on audition, and attends a party. Her day is full, but unsuccessful. Her car even gets towed. While walking on the sidewalk, the music spilling from a nightclub lures her. Sebastian is the piano player, imploding with musical talent and passion for jazz, but forced to play cheesy Christmas songs. Worse, when he performs an original piece, his boss fires him on the spot. At this crucial moment, Mia approaches him to express her appreciation for his music, but he brushes her off, understandably so. He just lost his job. As in most musicals, the hero and heroine meet again. There are many obstacles as they pursue their ambitions, but they fall in love anyway. Anyone who has seen “Crazy, Stupid, Love” (2011, directed by Glenn Ficarra and John Requa) knows that Stone and Gosling have a powerful romantic chemistry. “La La Land” fully exploits this rare gift, hypnotizing us with their luminous presence. One of the best scenes in the film shows the couple walking atop a hill, overlooking the glittering city at dusk. They sing about what a waste of a lovely night it is because they don’t even like each other. When they start tap dancing, their graceful moves tell us otherwise—they are madly in love with each other. And we are rooting for them. It’s refreshing to see actors, not singers, cast in a musical. “La La Land” is exhilarating because seeing Gosling and Stone together in a musical is both unexpected and loads of fun. It’s like coming home to find a surprise party with your favorite people in attendance. What joy! Chazelle directed the critically acclaimed “Whiplash” (2014), which established him as a talent to watch. In “La La Land,” he has proven himself twice over. He has created a romantic film—a musical no less—without being sappy or gimmicky. He’s faithful to the conventions of a classic musical, but he’s not old-fashioned. He maintains a contemporary sensibility, and this makes “La La Land” superior to “The Artist,” (2011, directed by Michel Hazanavicius). Both films are a throwback to the golden era of filmmaking, but “The Artist” is an outright mimic of classic silent films. The black-and-white movie is even set in the late 1920s. “La La Land” doesn’t copy or try to outdo Ginger and Fred. Rather, it pays homage to them by presenting a contemporary film (in full color) that preserves the romantic, wholesome, and feel-good trope they are famous for. “La La Land” dares to be different amid noisy CGI-ridden movies. Like Mia and Sebastian, the film dares to dream and risk big. It’s Hollywood at its finest—the perfect antidote to the gloom of 2016. Here’s hoping for a better and more joyful 2017, preferably with a whole new crop of great films!